I first read about falernum back around 2006 or so and I was entranced immediately. Anything mysterious, involving cocktails and coming from the Caribbean piques my interest and this stuff back then was quite mysterious to me. This is before you could find all the falernum recipes on the Internet so I was kind of stuck living in Kansas with no access to the stuff. 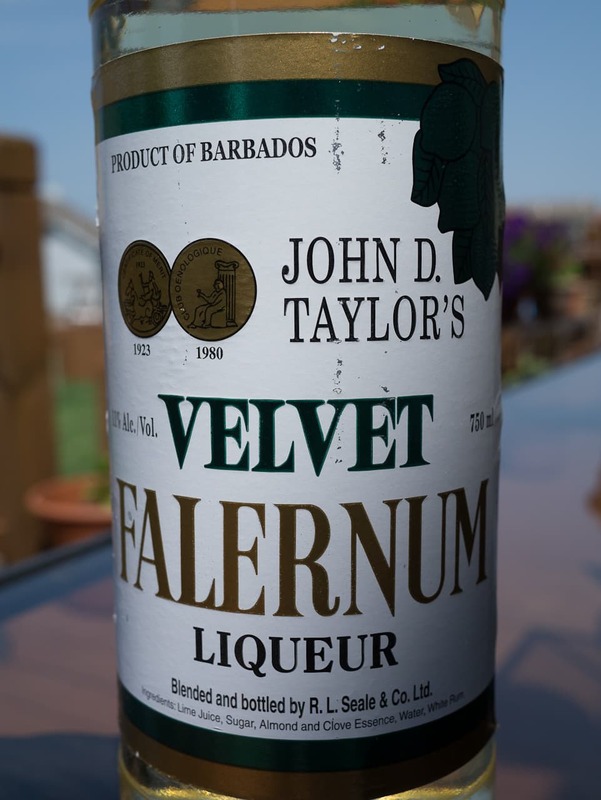 I read about John D. Taylor's Velvet Falernum being imported into several Eastern states so I called the importer. They told me to coordinate with a retail liquor store and a Kansas-based distributor to try to get their product in Kansas. After about four months of phone calls and emails Velvet Falernum finally showed up at Lukas Liquors here in Kansas. There were six bottles on the shelf and I bought the first one. The Lukas guy I have been communicating with thought I wanted the whole half case especially after going through four months of bother to get it into the state. Eventually I bought several more bottles and Velvet Falernum is now widely available in Kansas and Missouri. Falernum is a syrup that comes from the Caribbean. It usually is made with lime, ginger, cloves, and almonds though it might also contain vanilla. Sometimes a rum base is used to produce a slightly alcoholic syrup (Velvet Falernum is about 20 proof) but this is not required - you can find many non-alcoholic falernum syrups. Though it was probably made in the 1800's, falernum only started appearing in cocktail books in the early 20th Century. Once of the first adherents was Donn the Beachcomber who used it in a number of his Tiki drinks, notably the Test Pilot. The Luau restaurant created a knock-off that also uses falernum called the Jet Pilot. Some other famous drinks include the Corn and Oil and the rum swizzle which has several different variations such as the Windjammer Rum Swizzle on this site. I like Velvet Falernum but it does have a bit of a Rose's Lime ability to take over a drink. It is pretty intense with a lot of sweetness, apparent citric acid bite and plenty of cloves. I just backed off on the quantity specified in recipes and was relatively happy about it. Then I had some homemade falernum at my local craft cocktail hangout and it was a definite upgrade over the commercial version. It's not hard to make yourself and I have three or four recipes to sort through and compile into a master recipe. Once I have the results I will post my falernum recipe in this space.